Stopped in for lunch, looking for a hot meal on a cold day. The food was delicious, the staff was friendly and I was surprised to learn they are a late night spot as well. As a bartender and nightlife socializer, I will definitely be back with my friends after a long night working and having fun downtown! These folks specialize in tamales, lots of different types. Not just pork. Therefore their menu is limited to tamales and Frito pie. If you don't know what a Frito pie is you should try one. Not everyone likes them so don't be ashamed if you don't. Have more tamales. Gold Avenue, one block of Central in Downtown Albuquerque, has been undergoing more and more of a revitalization. There are good restaurants and coffee shops down there these days, and another one - Los Ortiz Tamale Kitchen - opened not too long ago. Not surprisingly (right? 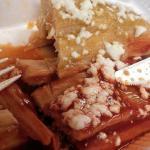 ), these folks serve tamales. You can get them to go, to dine in, in a plate or solo, smothered in chile or by their lonesome. They have salads and the usual sides, along with Mexican soft drinks. There are five varieties of tamales - red chile/pork, green chile/chicken, rajas (green chile strips with cheese), chicken mole, and elote (corn, peppers and onion). I have only had the first two (smothered and sprinkled with queso fresco crumbles), but they were fantastic. Also of a perfectly legitimate size and served at a reasonable price. I just popped in to satisfy my curiosity, but I'll be back - and I'll be bringing friends! Good stuff. 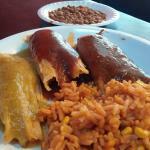 Been to Los Ortiz Tamale Kitchen? Share your experiences!